With packaging this cute and girly; so hard to resist. I've never been much of a girly girl but once in a while you would want to pick up a puff and just blush those cheeks. Etude House is the first korean brand focusing on exquisite beauty products that focuses on flawless skin, beautiful colours and princess theme packaging. Here's my first impression of this adorable brand. Etude House Lovely Cookie Blusher #7 Rose Sugar Macaron: By far this is probably one of the most natural pink blushes that I have. 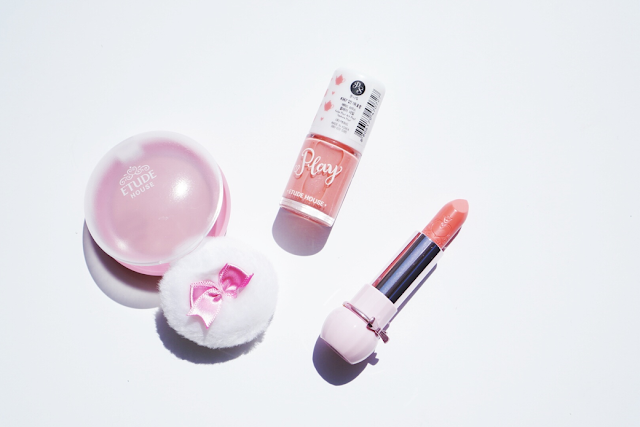 It comes with an adorable cute puff to apply the blush and a compact case that just feels so princess-y. It gives a natural inside out glow to the skin like your face just got pinched and to me that is that is the type of blush I like; natural and not too obvious. Etude House Play Nail Polish #367: What a cute pink with fine pink shimmers, the consistency is really easy to apply and dries really fast. I love the brush as they're more coarse and applies much more evenly without too many strokes. Lovely affordable polish! Etude House Dear My Blooming Lips-Talk - OR204: Very moisturizing lipstick. It is a very build-able colour with a coral undertone. It's a type of lipstick where you can use it in many different ways. But like most other lipsticks, re-applications will be needed throughout the day. Overall, I'm really impressed with Etude House. It has great quality, suits those who want to have a flawless finish but a pop of natural colour. I love their adorable cute packaging. I feel like a princess now with these makeup on hand!